this trail was pleasant though lots of poison oak. theres a fork in the trail where you can choose to walk across a quaint little dam wall, or you can go down into the gorge and do a little climb back up. interesting to check out the CCC buildings along the way. there's also a suprise picnic area with a great view from a large boulder. In the area for memorial day and decided to check out the state park. Wasnt expecting much but the trail provided. The loop was pretty enjoyable despite its short length as there were several good chill spots and scenic overlooks along the way. Followed the edge of the lake and there were many wildflowers in bloom. Only real complaint would be the abundance of boats blasting music but this was to be expected. This trail is advertised as 3/4 miles, but truly is longer if you take the branch that follows the beach. 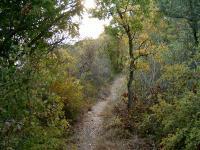 Starts out fairly plain and level, but as you approach the beach line, steep rocky descents and ascents are common. 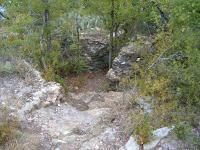 The trail starts at about 1500 feet, then at its lowest is 1400 feet, somewhat near the water. Some areas let you get close to the rocky beaches. 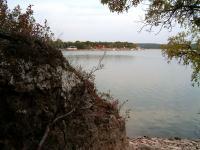 Limestone outcroppings offer several scenic overlooks, where you have spectacular views of Lake Brownwood. Goat Island is almost always in the picture throughout this hike. Toward the end near marker 16, the trail splits. The right-hand fork will take you back up to the trailhead. 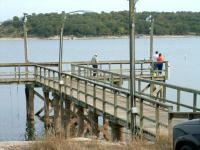 The left-hand fork will follow the beach until you come across the fishing pier. Here is a good spot for a break. From here, follow the paved road back up a short ways until you see stairstepping stones up the hill on your right. Follow this steep rise up. Continue through the next camground where you reach the pavement leading to where you parked at the trailhead. 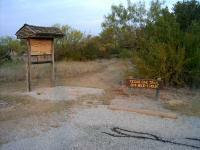 Be sure when you do this hike to pay at the front and ask for the Texas Oak Trail guide. 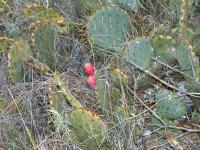 16 markers have different plant life to see, and you can also get a birding guide. Some markers have been damaged, but if you check which ones you've seen, you'll know what you're looking at. All in all, a quiet hike with only noise being occasional military aircraft from Abilene flying nearby.